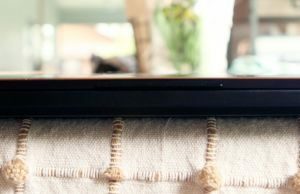 Summary: The MSI GS65 has it where it counts in many ways. 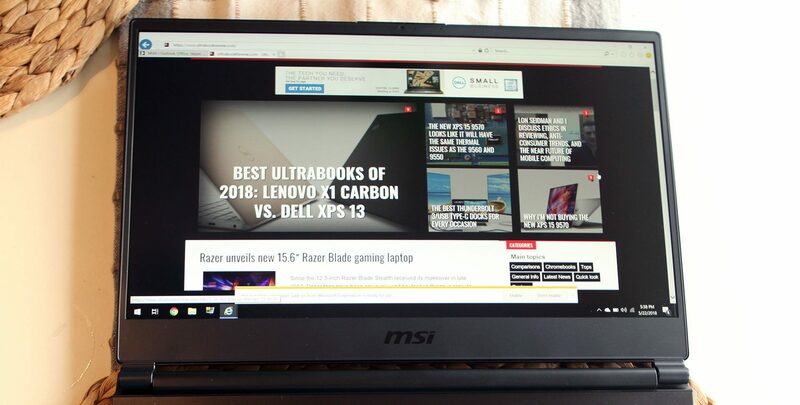 It looks a whole heck of a lot nicer than the previous MSI models, it gets a nice IPS 144 Hz screen with tiny bezels, a better keyboard and powerful hardware that actually performs well, with some tweaking. On the other hand, there are two big faults with the machine and that’s the build quality and the cooling system, which can be corrected to some extent. Read on for the whole story. 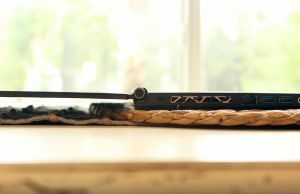 As a repeat customer of the MSI GS series laptops, I’m pretty much accustomed to the pros and cons each one had to offer. None of them were perfect, but for the most part they suited me very well. 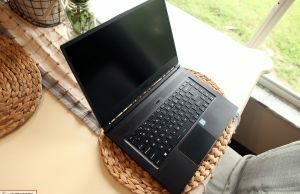 The GS60 was one of the first thin and light laptops that offered a high-end mobile graphics card in it (the Nvidia 870m at the time). After another GPU generation and two CPU generations, they finally updated the body style to the GS63VR, which I also liked, but not as much as it’s bigger brother, the GS73VR. I thought they’d stick with that chassis for one more generation, but MSI changed things up a little more this time and it’s really perked my interest. 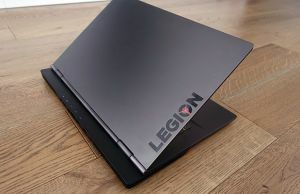 Not only are they jamming the hexa-core processors into the same thin chassis, but they are also doing it in a near 14” form factor, with a 15” screen. 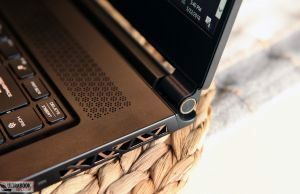 There’s lots of other stuff that’s changed in the GS65, and after a couple of weeks of owning one, I have a lot to say about it. I ended up picking up this machine from GentechPC, as they were offering a free repaste job, without voiding the warranty. 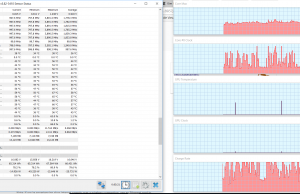 After all the early reviews, I was really concerned with the throttling CPU temps, so I felt that a repaste right off the bat would be nice. Was it worth it? Well, yes, but there are some other things you can do to fix the thermals. Read on to see what I found out. Update: Our follow-up review of the 2019 update with Nvidia RTX graphics is available over here. 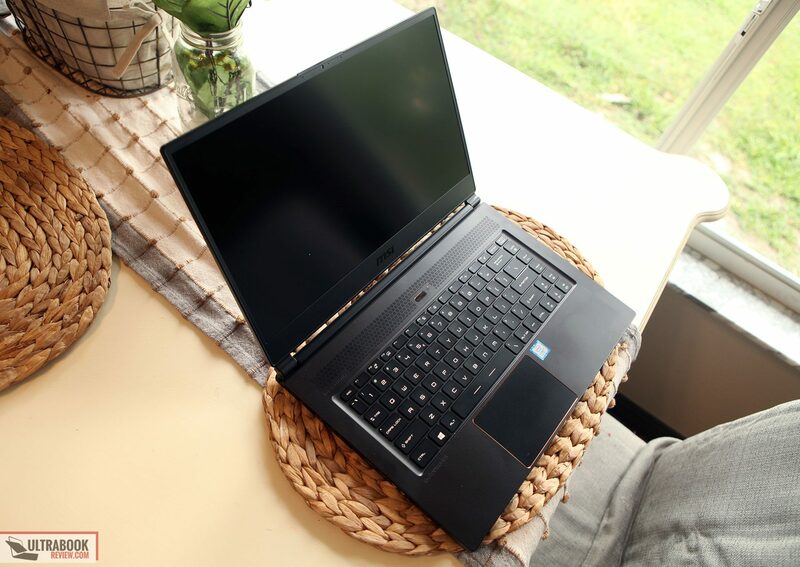 With the laptop closed, the GS65 feels almost identical to the GS63VR. It’s well balanced, light and very thin. The only major difference in the feel is there’s no more felt on the bottom. Most of the laptop is made of black powder coated aluminum but there are some plastic components too. At least the plastic components look and feel pretty good quality. The build quality is touch and go unfortunately. In the first moments with it, the laptop does give you the impression of being a very sturdy device…with the lid closed that is. With the lid open, it’s a different story. Picking it up with one hand from either side of the trackpad results in a noticeable creaking sound. It also happens slightly from the sides, but nowhere near as bad as from the front. Consider handling this from the sides if you plan on moving it with the lid open. You’ll also hear some occasional creaks from the corners while typing. I’ll admit, I wasn’t a fan at first, but I am more used to it now. If you’re a previous GS laptop owner, note that these are not problems I’ve seen before. There might be a creak here or there on the older models, but none as prominent as with the GS65. The problem is almost definitely because of the internals. I’m skipping ahead, but the battery is much much bigger on this model, and stretches along the entire front edge, under the trackpad. It’s not glued in either so it’s basically just floating in there and leaves room for things to flex around when gripping the overly thin piece of aluminum. MSI tries to fix it with these cross beams, but they’re made from cheap plastic and just flex(and might be the root cause of the creaking noise.). I plan on taking a stab at fixing this problem in the future. Back to the design, with the lid closed again, you have a nice clean laptop lid – far different than the red bling MSI usually puts on their laptops. 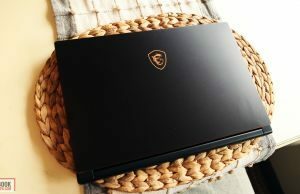 Instead of an MSI logo and a glowing red dragon, MSI decided to grow up a little and put a classier looking gold emblem. A huge improvement in my opinion, and I wouldn’t be embarrassed at all at taking this into the office with me. I think most people might think that emblem is my favorite soccer team or something. Nothing else exciting on the lid except the gold cut chamfer along the edge – also a nice touch. Opening the lid is still a one finger action. The hinges are a little different looking this time, but they seem sturdy enough. By the way, this lid opens up to 180 degrees. Underneath the lid you’ll see the 15.6” screen surrounded by very tiny bezels. More on the screen later. Centered up top of the screen is one of the smallest webcams I’ve ever seen on a laptop. This is much better than the Dell/Gigabyte approach of the “up your nose” webcam. The bottom bezel is a lot bigger than the rest, likely to maintain the cooling footprint. 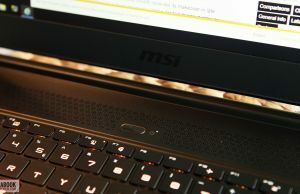 Centered on the bottom is a very subtle MSI logo. Beneath the screen is the Steelseries keyboard, slightly different from previous models. More on this and the trackpad later. But above it is a single power button with a dual colored LED. The LED glows white for Optimus and orange when the dedicated GPU is active. Along the bottom are a bunch of stickers you’ll want to peel off. 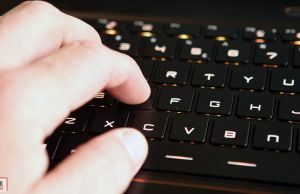 There is also a couple of debossed logos above and below the right hand side of the keyboard. They are hardly noticeable, but I think it would have been better not to block off some valuable holes for the GPU fans just to have a Dynaudio logo. 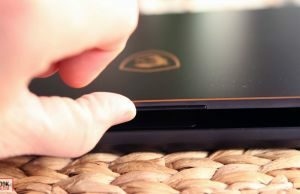 According to some reviews, the power button is supposed to be a fingerprint reader, although there are no drivers for it yet. The drivers are supposed to be released at a later date. The resellers say differently though and claim the fingerprint reader will be available in a future SKU. If you’re holding out for the fingerprint reader, you might want to wait and see. I did notice a driver temporarily on MSI’s website for this model, but there was no installer yet. The front edge is well rounded and perfect on your palms while typing. Other than that, there isn’t much else to see. This isn’t a unibody construction and MSI did it a little differently this time as well. Instead of having the top half of the casing go all the way to the bottom, they decided to stop halfway. There’s still a slight edge in some spots on the front, but you’ll never notice it in a practical sense. There’s certainly lots of IO on this machine. Starting on the left is two USB 3.0 ports, an ethernet adapter and separate headphone and microphone jacks. The headphone jack supports Hifi headphones. Towards the rear is the GPU exhaust and a Kensington lock. The GPU exhaust has matching gold color to the rest of the trim. On the right hand side is another USB 3.0 port. Next to that is a USB-C port which also doubles as a Thunderbolt 3 connection. That didn’t stop MSI from also including a miniDP and HDMI port as well. The power connector is a little close to the center of the laptop for my taste. 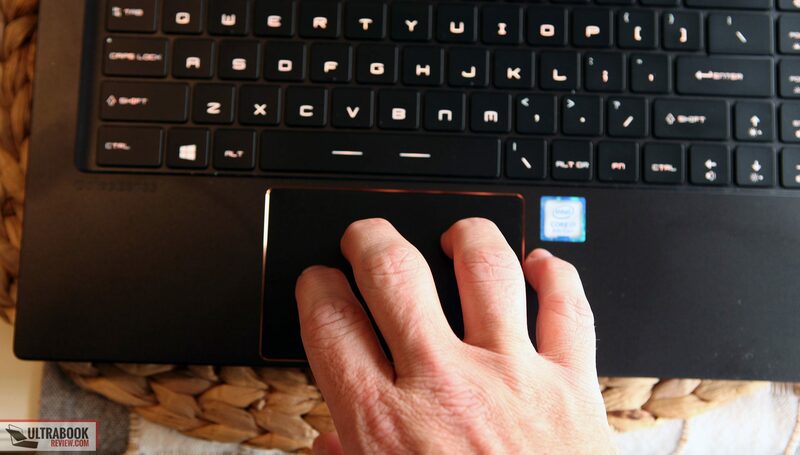 Most people are right handed and this could get annoying with a mouse. At least the connection has a 90 degree to it, although then it partially blocks that CPU exhaust. 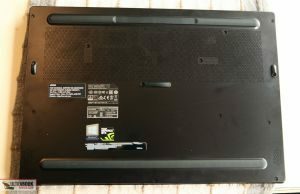 The back edge of the laptop is nothing more than exhaust for the GPU and CPU. It’s one of the few spots that’s made of plastic, but it blends in quite well with the aluminum. Switch back to the front and there’s nothing to see except a single indicator light for charging. Thankfully, MSI decided to go with a subtle white LED instead of the red lasers of the GS63VR. The bottom of the laptop has two very long footpads and three smaller footpads. They’re effective enough, but there is a little flex in the corners, mostly because of the laptop build quality being what it is. There are also some vents on the bottom, but like the other GS series models, these are passive vents and don’t necessarily draw in cool air from the bottom. Lastly, there are a lot more stickers on the bottom lid, most of which can be removed. Oh yeah, and let’s not forget the pair of downward facing speakers. So, while I’m pretty excited in with the new, smaller footprint with smaller bezels, I’m a little bummed with the diminished build quality in this year’s model. It’s not enough to sway me from keeping it, because there are many other factors to consider(which I’ll get to shortly). But it would be a put-off for some of you for sure, especially given the cost of the machine. The Steelseries keyboard on the GS65 may be slightly different than the previous models, but it’s still a great keyboard. I’ll admit, it did take me a little getting used to. But after a day’s use, I was very accustomed to it and I love it all the same. The key travel is actually less than the previous models, measuring an average of 1.4mm of travel per key. The feedback is excellent though, at about 70 grams of force needed to apply a keypress. Even though it was different, I still found it to be easy to type on and I was able to hit 58wpm on my typing test(above average for me). I didn’t experience any keyboard flex on this model – something that was 50/50 on previous models and was all dependent on how well the internals were fastened on the inside. My overall typing experience with this keyboard is well above average. The layout is a little different from the GS63VR. First of all, there’s no room for the numpad. Well there is, but you probably don’t want them to so what Gigabyte did with the Aero, with the cramped keys. The good news is, without the numpad, the key layout on this model is a little more logical. 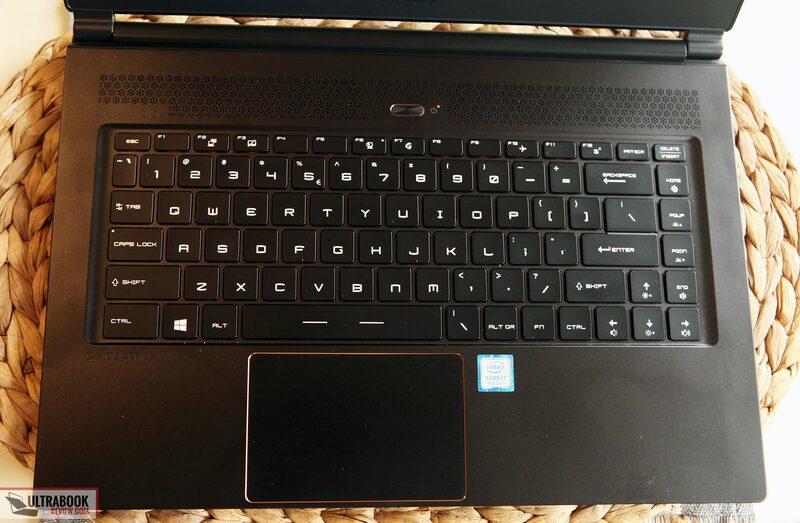 The Windows and Fn keys are in more traditional spots and the Delete key is where it should be. The Fn key being on the right is huge for this model, since most for the useful hotkeys are located over there and you can now do it all one handed. If for whatever reason you prefer the old way, you can still switch these keys in the bios. 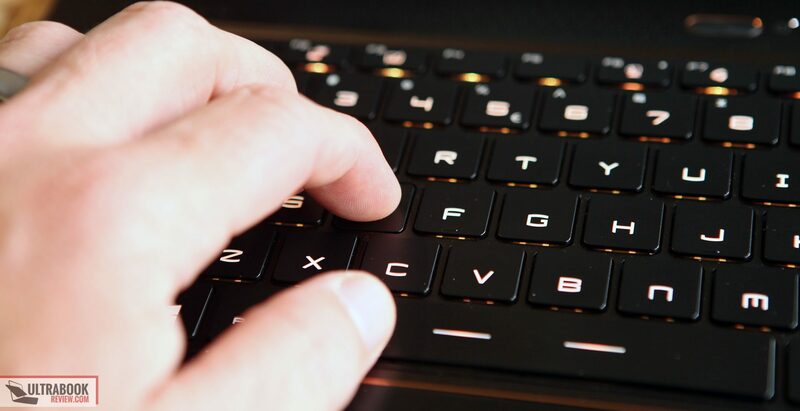 Other than that, the only oddball key is the backslash key on the bottom row, which is also above the enter key. Not sure why two are needed. The RGB backlighting options are very nice on this laptop. 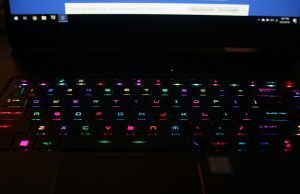 Like the Razer Blade and Gigabyte Aero and Aorus lines, the keys are all individually lit and can be customized to your liking. The Steelseries software is pretty easy to customize and comes with a lot of pre-defined profiles. Just fit Fn and a number key to quickly switch between them. The font is the same unique look of all the previous GS series models. Most of the letters are squared off and definitely look different than the norm. It’s something I’ve grown accustomed to over the years, and I can’t say it attracts any unwanted attention. The trackpad is also something that has improved somewhat. Instead of the typical Elan trackpad that has been used in the past, MSI chose a Synaptics version instead. It’s feels like a glass trackpad with a matte finish, so the surface glides smoothly, but not too smooth. Tracks, clicks and multi-touch gestures have been working great for me with this one and I’m very happy so far. Pinch to zoom works much better on this trackpad than the previous ones. It’s a clickpad – sorta. Only the bottom half of the trackpad clicks, while the upper half is really stiff. 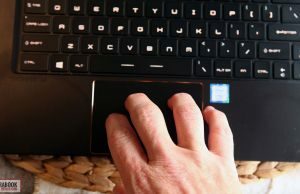 The right click zone can really only be initiated on the bottom right anyways, but those that are used to left clicking anywhere else will probably be a little disappointed. I’m more accustomed to single and double taps for clicks, so it doesn’t bother me at all. The software is a little different, as the options are all integrated into the Windows settings. This opens up a few more options that traditionally aren’t available, such as remapping the three and four finger gestures to some more useful things. It’s not perfect, because I’d still like to see two finger swipes go back and forth between web pages, but I can live with what is offered now. This is easily the best trackpad/keyboard combo on an MSI GS unit to date. I’m fully pleased with both and there’s very little I would change. I might miss my numpad someday, but it’s totally worth giving up for a smaller form factor. 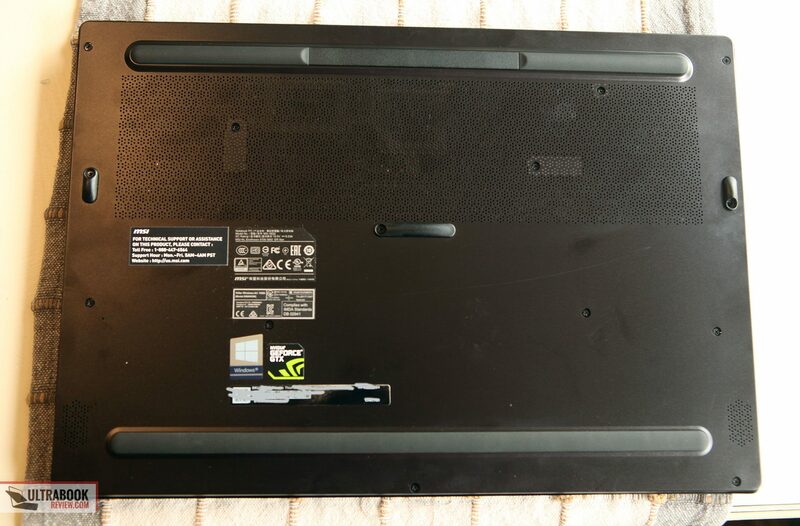 Another great highlight to this laptop is the panel they put in it. Not only is it 144Hz, it’s also an IPS variant and looks fantastic. I’ve always liked the faster laptop screens, but I don’t think I’ll miss TN ones at all. 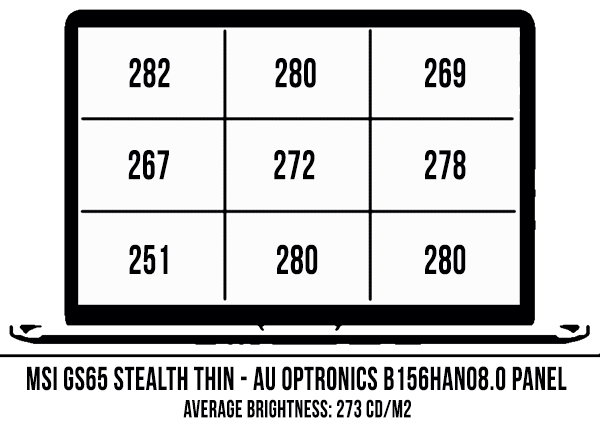 The panel is a 15.6” matte AUO display, with the model B156HAN08.0. The max resolution is 1920 x 1080 px. It’s not truly an IPS screen but it might as well be. The viewing angles are pretty much spot on with what you’d expect out of an IPS screen. There’s no color distortion at the extreme angles, although there is a little bit of brightness lost. Using my Spyder4Pro, I measured the color gamut of the screen. There’s been a couple reviews that claim this is a wide gamut screen, but unfortunately that is not the case. It’s still a good color space though and the calibration right out of the box is actually pretty good. I measured 97% sRGB, 71% NTSC and 75% aRGB. The measured contrast ratio hovered around 750:1, which is pretty good. But the maximum brightness I got only measured to be 282 nits. This is fine for indoor use, but outside on the porch with harsh lighting might make the viewing experience a little difficult. The minimum brightness is a mere 12 nits, which is nice for nighttime viewing. Also, the blacks are pretty close to black, measuring .32 nits at max brightness. If you haven’t used a fast screen before, you’re in for a treat. I’ve been using 120Hz monitors for several years now, and I find it difficult to go back to 60Hz screens. This IPS screen is perfect for my needs, and I have no regrets reverting back to a FHD resolution in order to get it. I’d much prefer a faster screen at low resolution over a 60Hz 4k screen. 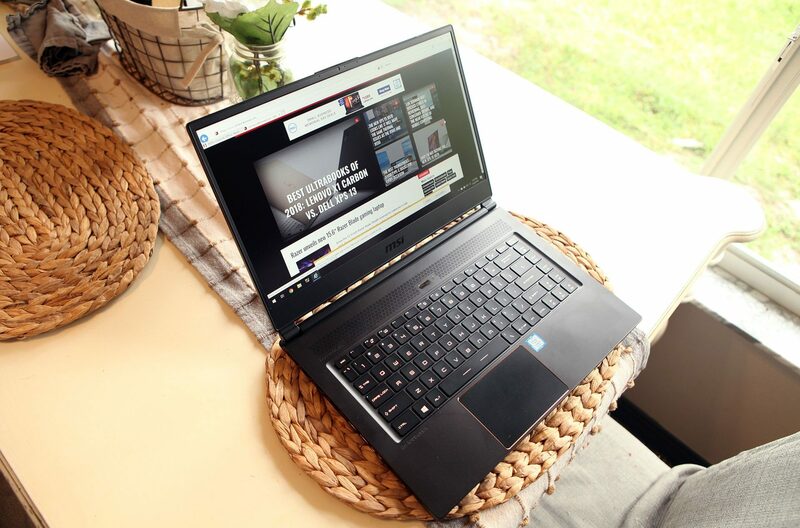 The Stealth Thin GS65 comes with the new Coffee Lake Core i7-8750H hexa-core processor. The base clock is 2.2 GHz, but the boost clocks actually go up to a whopping 4.1 GHz. This is a huge improvement over the i7-7700HQ that was typically seen in the thin laptops of last year. Pretty much everything I’ve thrown at it has opened quickly and the response time is spot on. Even on battery, this machine feels like a beast. This model also comes with Optimus installed with a Nvidia GTX 1070 Max-Q GPU. The switchable graphics is perfect for battery life concerns and I don’t think I’ll miss GSYNC all that much. With a 144Hz screen, you aren’t really going to get a whole lot out of Gsync, since your in-game framerates probably aren’t going to surpass the maximum. MSI has mentioned that they’re trying to certify this screen for GSYNC. Whether that means that GSYNC will even be switchable for this model remains to be seen. Asus has been offering it as an option in their new line, so it is a possibility, but I’m not holding my breath. The graphics card is pretty powerful for such a thin device, albeit Max-Q. It’s pretty much the fastest graphics card you’re going to find in a machine this small, with the exception of the new Asus Zephyrus. There are some drawbacks to that machine though, and I personally think the GS65 offers a better balance of battery life, for your on the go needs. My unit came with a single stick of 16GB DDR4 2400Mhz RAM. It’s single channel since there’s only one chip, so it will have some effects on certain games and programs. I didn’t notice any difference in my testing, as I probably don’t have any games that were affected, but I thought it would be important to mention. Other models have been reported to have 2x 8GB modules, so YMMV. Of course, if you purchase a 32GB model, it’s 2x 16GB modules. 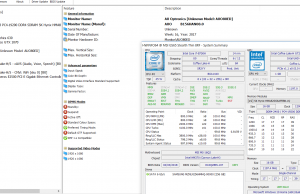 The SSD in this model is nothing special – it’s actually SATA and not NVMe. 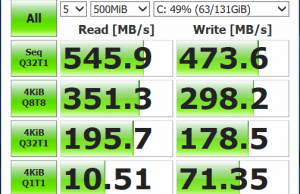 The 256GB version is pretty average as far as SATA M.2 drives go. It’ll get you by, but you might want to add another drive in the future. Other models from resellers offer NVMe drive options, so check the specs carefully before buying, if it’s one of your concerns. Speaking of upgrading, let’s talk about what can be done. First off, to open the system, you might have to break a warranty sticker. Fortunately for the US and Canada, that sticker means nothing. For everyone else though, opening that sticker means your warranty is void. So if that applies to you, you’ll probably want to make sure everything is functioning properly before venturing forward. If you care to continue, just remove all the Phillips screws you can see on the bottom panel and start from the bottom edge. Then work your way up and unclip the grill at the back vents. Once inside, you won’t see anything you can replace really. And that’s because the motherboard is upside down on this model. In order to get to it you need to remove the battery, the Wifi card, all the various ribbon cables and two motherboard screws. Then the motherboard can be lifted off from the left hand side. On the other side, there are two M.2 slots, SSD1 which accepts SATA and NVMe drives and SSD2 which only accepts NVMe. There are two ram slots, which can be expanded to up to 32GB of RAM. If you’re not comfortable doing this upgrade and/or you’re afraid of voiding your warranty, this is where you might want to consider purchasing from a retailer like I did. I ended up getting my unit repasted with Thermal Grizzly Conductonaut Liquid metal, through GentechPC. They also offer services to upgrade the SSD and RAM as well, so it might be worthwhile to check them out, if that’s what you’re considering. 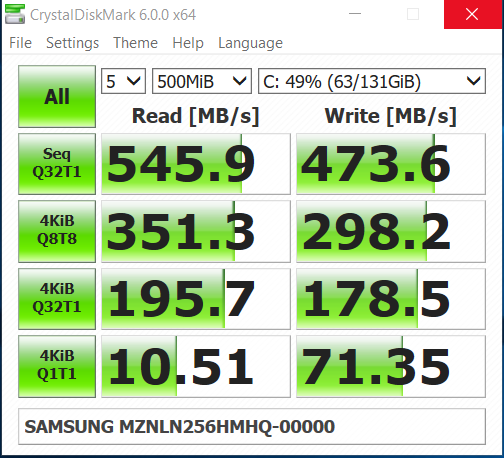 I ran some benchmarks on the GS65, which you can see below. I also benchmarked a number of games to give you an idea of how the GTX 1070 Max-Q performs. Note that my temps are with the LM paste job and I meddled with the fan profile since the auto profile I found to be insufficient. More on that in the next section. 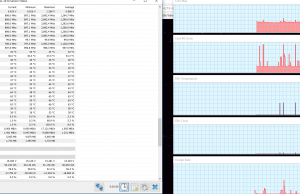 CineBench R15: OpenGL 112.76 fps, CPU 1061 pts, CPU Single Core 171 pts. After the second year with the Pascal series graphics laptops, the GPU results are no surprise over last year. But the CPU results are a huge improvement! 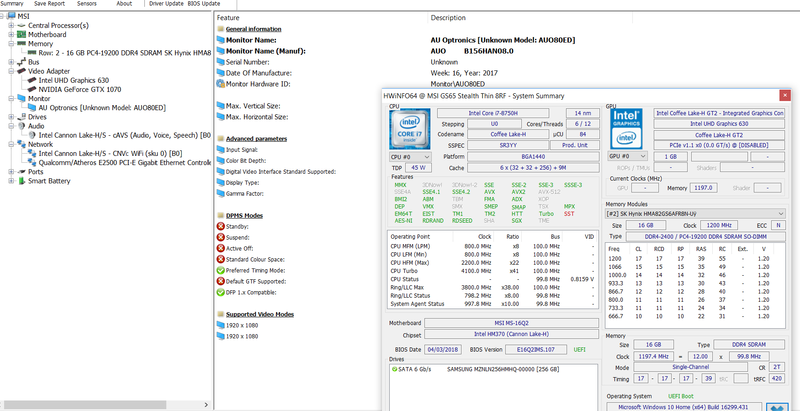 The Cinebench scores show a 50% improvement over the i7-7700HQ of last year’s model and are, in some metrics, a bit better than the i7-7820HK – a CPU found in only larger sized gaming laptops. As you can see from the results, the 1070 Max-Q GPU is more than enough to utilize the 144Hz screen on this model. It’s not going to max it out on all games, but you can probably tweak the settings down to your liking, if refresh rate is the concern. Overall, I’m very happy with how this laptop performs, both with gaming and productivity applications. 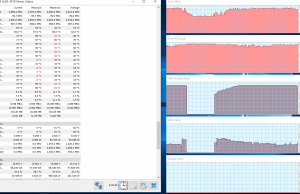 The hexa-core CPU makes a big difference and most apps open very quickly. I do think it’s a little too much for this thin package though, which leads right in to what I have to say in the next section. Ok, so the cooling system is going to take quite a bit of explaining for this model. The CPU and GPU appear to be independently cooled like before, and again the GPU has two fans instead of one. But because of the smaller footprint, the heatsink is a little smaller than before. On top of that, a hexa-core processor is quite a bit more challenging to cool than the quad core of last year. In other words, this thing gets pretty hot. First, let’s start with the noise the fans make. I took some noise readings from my sound meter (BAFX3370). Overall, the noise levels are pretty reasonable on the GS65. Beware of that auto fan profile though, because it’s a little too good to be true. 40dB fits the Max-Q specification, however it comes at a great cost heating up the components and throttling. Even with my liquid metal paste job, my CPU experienced thermal throttling and reached temperatures in the 90s on the auto fan profile. More details on this in a moment. Like I mentioned, this laptop gets very hot, and it’s unfortunate that MSI didn’t include the felt on the bottom like before. 64C is a bit extreme and you might want to have a laptop cooler to rest this on if you plan to play on your lap. 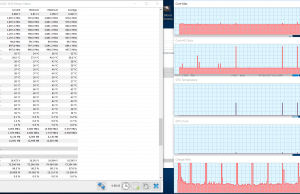 Test Paste(both GPU and CPU) Undervolt Fan Profile Max CPU Max GPU CPU Throttling? 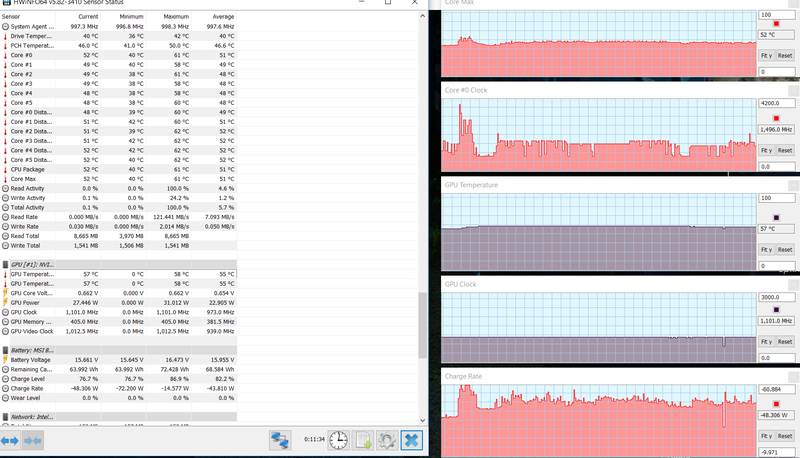 As you can clearly see, the CPU is incapable of being properly cooled with the fans in Auto. Depending on what paste you use, you get varying results. The stock paste seems to have better consistency in temperature variation than Kyronaut, but liquid metal seems to remove most of the problem. Of course the problem is truly with the fans though. With the fans properly set, you can easily remove most of the thermal throttling problem. You can use Cooler Boost (through Dragon Center), but that just puts the fans at maximum the entire time. The other option is to use the Advanced profile, where you can set the fans to low for low temperatures and ramp up the last two settings. I just set mine to 120% and 140% for both the CPU and GPU and it works fine. Note that these results should probably be taken with a grain of salt. Paste jobs can easily vary from person to person, and not two heat sinks are truly the same. 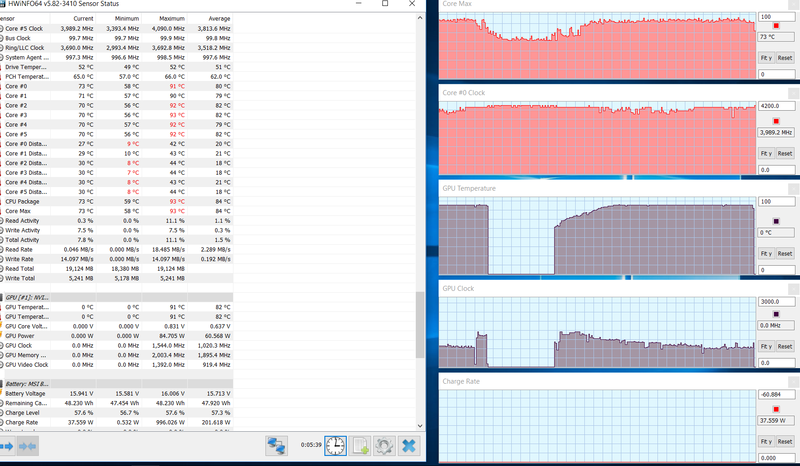 But you can see the potential advantage of using liquid metal on the CPU and even a better thermal paste on the GPU. But the real difference maker is by undervolting your CPU, which pretty much removes most, if not all CPU throttling, with the fans properly running. 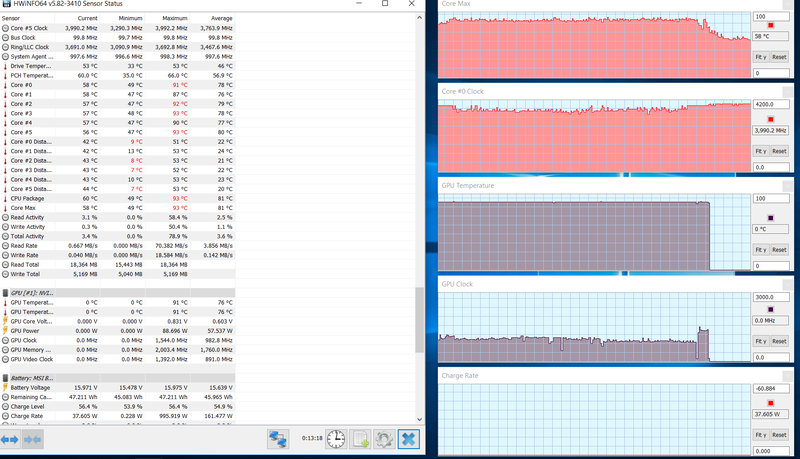 Even with the stock paste, thermal throttling is pretty much non-existent for the CPU. Those stock GPU temps aren’t all that bad either. 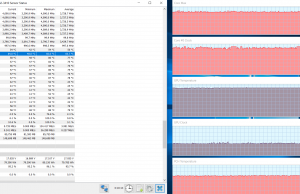 It’s safe to conclude that using the stock paste job is probably fine, but you’ll at least want to tweak your fan profile and probably should consider undervolting as well. If you do decide to repaste your laptop, I’d recommend Thermal Grizzly Conductonaut for the CPU and Kyronaut for the GPU. This has been my typical combo recommendation since liquid metal has given me trivial results on GPUs and the risk isn’t worth the reward. Note that using liquid metal paste has some risks and should be installed by a professional if you don’t know what you are doing. Want another tweak to help? In Dragon Center, you can also set the Shift mode to “Comfort” This is basically a modified balanced power profile which uses the CPU frequency when needed, instead of keeping it maxed out all the time. The other profiles use a modified High Performance profile. 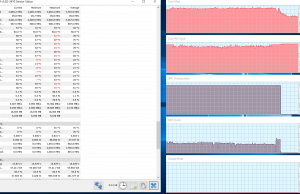 In all my testing, temps dropped by a 3-5C on both the GPU and CPU and had negligible effect on actual performance. The connectivity options on this laptop are pretty abundant. There are two USB 3.0 on the left and a third one on the right hand side. Unfortunately, the USB ports on the left hand side are extremely close together and might cause problems connecting two devices. It’ll depend on how thick your adapters are. For your monitor needs, there are three outputs, including mini-DP, USB-C thunderbolt 3 and HDMI. This should suit everyone’s needs, including those that want to use this machine for VR. It looks like MSI omitted the SD card reader in this model. I wasn’t too much a fan of the previous one, as it was USB 2.0 and was super slow. Still, having one was better than nothing. More room for the battery was probably their biggest concern. 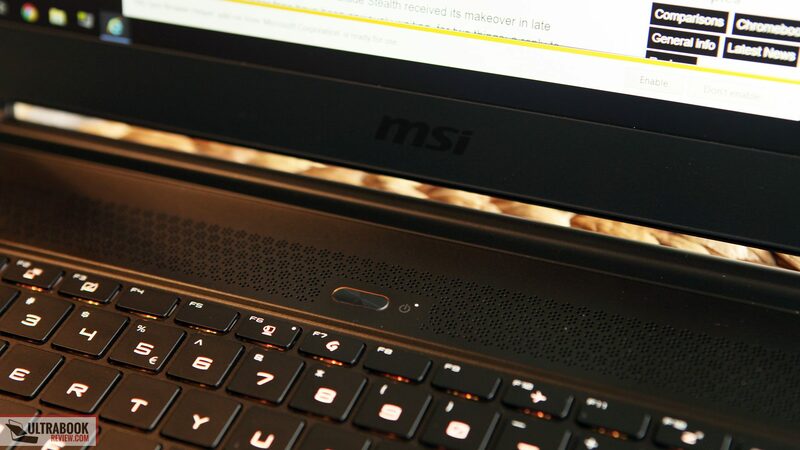 Radios – The MSI GS65 comes with a Killer Wireless AC 1550i module. Bundled with the module is the Bluetooth 5.0 chipset. Overall the card performs pretty well, as I haven’t had any drops in connection at all. The reception on the antenna is very good. I took a speed test 25 ft from my router and maxed out my ISP(125Mbps). Even at 100 feet I still got 100Mbps, which is very good. No complaints with the wireless card at all. Speakers – Moving along, there are two stereo speakers and they are both downward facing. They are surprisingly loud but lack bass. The mids and highs are actually pretty decent though. I played my typical song that I normally test and the amplitude reached 84dB, at my ear level. I also ran a bass test and was able to hear frequencies as low as 100Hz. The software is controlled by Nahimic software, which I couldn’t get to change a whole lot with the audio quality. I’m guessing it’s because I did a fresh install, but perhaps there might be a problem with the software version itself. From my experience though, that software doesn’t improve the quality – it merely adds filters to isolate the sounds you want. The headphone jack is pretty good however. It supports Hifi headphones along with Windows Sonic and Dolby Atmos. My Bowers and Wilkins P5 headphones brought rich, full sound to my ears. Webcam– The only thing special about this webcam is the size of it. Meaning, it’s small enough to go above the screen within the tiny bezel. Other than that, it’s your standard below average 720p webcam. In good lighting, the picture is decent. But in low light, it’s incredibly grainy and the colors are muted. The sound is a little tinny as well. It’s good enough for communicating, but not live streaming. There’s a keyboard shortcut to disable the webcam, if you want privacy. MSI upped the stakes by adding an 80.25Whr battery into this machine. Of course, that comes at a slight cost. For starters they had to remove the 2.5” bay that was in the previous models. 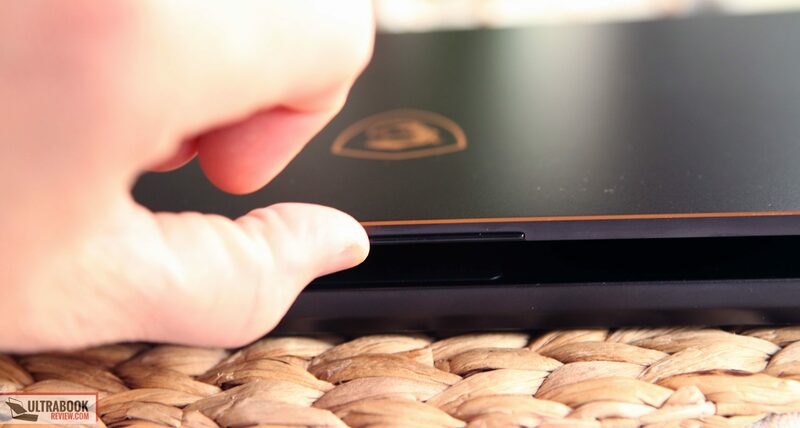 It’s also partially responsible for the front flex of the machine, since the battery encompasses the entire palm rest. Was it worth it? My battery test for the GS65 consists of using the stock “Power Saver” power profile, 40% brightness (80 nits), wifi off, Bluetooth off, and running a 720p movie in a continuous loop at full screen with the volume muted. I start the clock when it’s unplugged and stop it when the unit performs a self- shutdown. 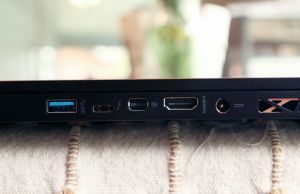 The MSI GS65 lasted a decent 7 hours and 15 minutes before shutting down. In the following test, we’ve set the screen’s brightness at 40%, which is about 80 nits. Also the keyboard backlighting was set to minimal. This is the best battery life I’ve seen for the MSI GS series laptop yet. The bigger battery is clearly worth the loss of the 2.5” HDD bay, and it’s a good thing they left Optimus enabled. Using this both for both work and play is definitely feasible. Power Brick – Another notable item is the compact power brick. It’s a 180 watt charger, which only measures 6”x2.85”x.9” and weighs 1.25 lbs. This is about 30% smaller than the one on the GS63VR, which was 6.1”x3.0”x1.2. The combined weight being under 5.5lbs is a very nice feature to this gaming laptop. 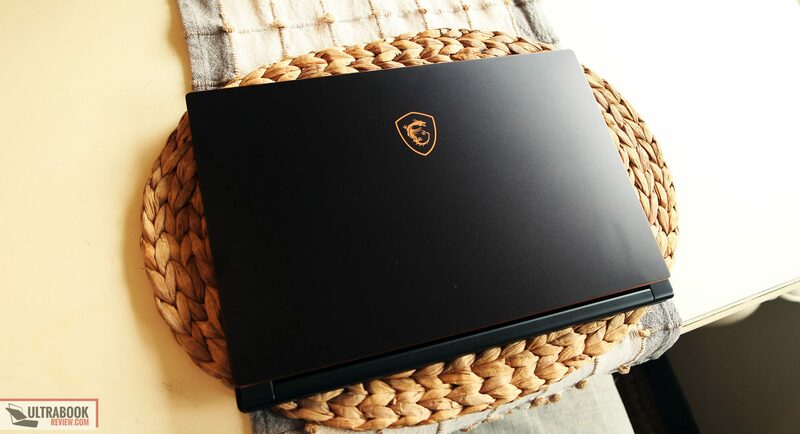 The MSI Stealth Thin GS65 is available at multiple retailers. 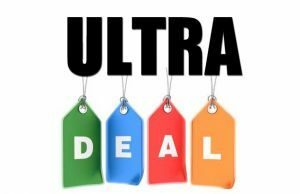 Both Amazon and Newegg have many units in stock ranging in prices from $1899 to $2099 depending on the graphics card you choose(1060 or 1070). There are even more pricey options if you opt to go with more SSD space and RAM. The model I received was $2129 with GentechPC and included a free repaste job of the CPU and GPU. 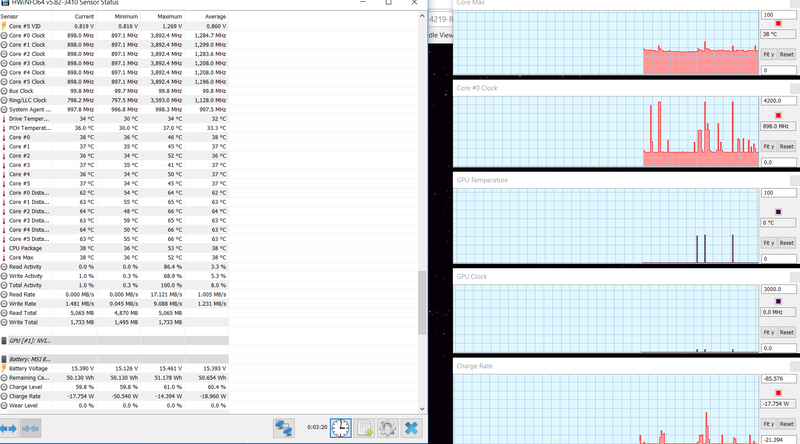 Note however, that the equivalent model on other sites has NVMe SSD while mine was only SATA. Again, like with the GS63VR, you get more bang for your buck by purchasing the 1060 models. There really isn’t any justification for the cost difference in the 1070 Max-Q, especially since it doesn’t perform like a full GTX 1070. But if you want the best performance in a thin and light package, the top models are the way to go. The good news is the competition isn’t any cheaper. Faults aside, I’ll be keeping this laptop for sure. It has it where it counts in many ways. For starters, it looks a whole heck of a lot nicer than the previous MSI models, which I tolerated. Getting rid of that glowing dragon logo was a good start – but also improving the overall aesthetic by smoothing out the lid, removing red highlights and minimizing the footprint are huge factors in my book. And let’s not forget the screen! Not only did they reduce the bezels by a longshot, they fit a 144Hz IPS equivalent panel in there, which looks and plays fantastic. GSYNC would have been a nice option but I think they chose correctly with Optimus support, especially in order to get that killer battery life everyone wants. The keyboard changed a little and it was great before, but I think it’s for the better now. The individually lit keys are much more convenient than three zone lighting. The layout is also better, albeit without a numpad. I’m also happy with the trackpad improvements. Obviously, there are two big faults with the machine and that’s the build quality and the cooling system. 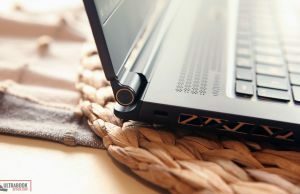 The creakiness of the laptop can’t be avoided and if you’re the kind of person that it will annoy, this machine is probably not for you. The cooling, however, can be corrected. But it’s going to take a little work, either by repasting or undervolting. You could, of course, do nothing – that’s what throttling is for. 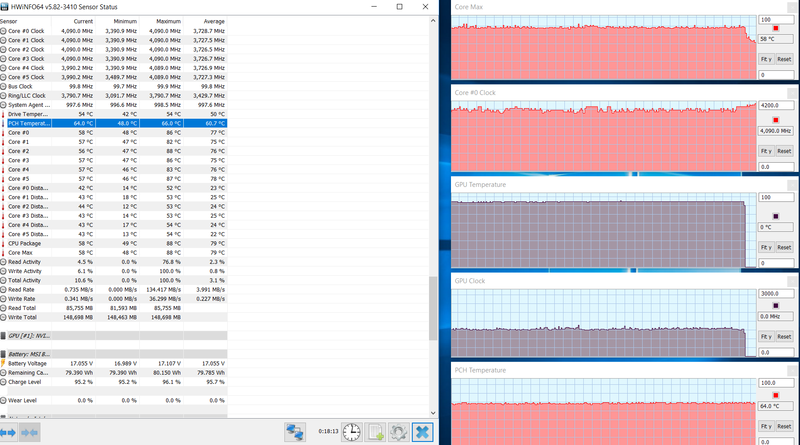 But I wouldn’t feel comfortable knowing my CPU reaches 90+C on a daily basis and for hours at a time. MSI could have done a little better tweaking the default settings in order to correct this. I personally can live with the build quality, as I tend to take very good care of my laptops. The pros, in this case, very much outweigh the cons for me. But that may not be you, so you should consider carefully before purchasing. If you’re in the US, I’d recommend hitting up your nearest Best Buy and take a look at the display model before you make your decision. If the GS65 isn’t for you, there are a couple of competitors out there. 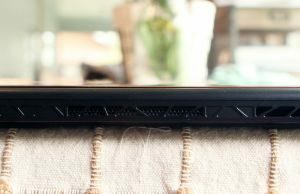 The Gigabyte Aero 15x is probably the closest, since it also has a very small footprint and pretty much has identical specs. The major cons are it’s a little more expensive, has the webcam under the screen and the design is a little more angular looking. But there are some pros too, such as better build quality, better out of the box cooling and a NumPad. I have heard that the keyboard is very cramped though and isn’t as easy to type on. 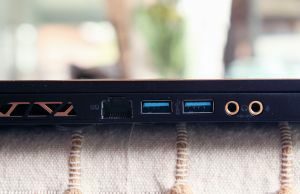 Another laptop to consider is the new Asus Zephyrus M GM501. This laptop packs a full GTX 1070 instead of the Max-Q version. 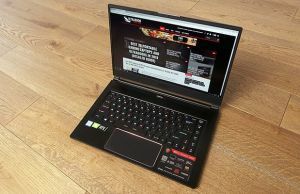 They also improved it over the previous Zephyrus GX501 by putting the keyboard and trackpad in their proper locations. The only drawbacks are it maintains the “gamer” looks, with red lights and accents. It also has a much larger footprint with bigger screen bezels. If you want the added performance, it might be worth it, but it’ll cost you a little extra. The Zephyrus S GX531 is a newer model in the Zephyrus line, with a compact design, thin profile, modern hardware, and 144 HZ screen. It’s available with either GTX 1060 or 1070 Max-Q graphics, just like the MSI GS65, but builds on the original Zephyrus, which means the keyboard/trackpad are oddly positioned and there’s only a small battery inside. 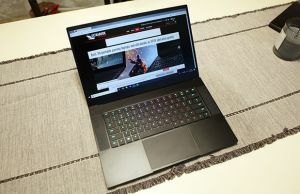 Then there’s the new Razer Blade 15 Advanced. They just updated their 14” model to include a 15.6” screen and the entire laptop pretty much has the same specs as the GS65. I haven’t seen many details on this one yet, but you could probably count on a better build construction with the unibody design. But unless their track record has changed, you might also be dealing with QC issues. With the same specs as this machine, the Razer Blade is $300 more as well. So that about sums it up for the GS65. Hope you found this article useful. I’d appreciate hearing your thoughts in the comments below. Since I’ll be having this one for some time, feel free to ask any questions if you want to know anything more. 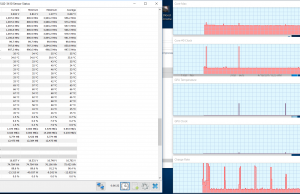 Can you please point to an article how the undervolting is done? Also what are the side effects for the health of the CPU by doing this, and why isn't manufactured that way if the laptops are working so much better? Thanks! Also, there's no side effects, if it's done correctly. If you go too far, you get a blue screen followed by a reboot, so the key is tuning it properly. All processors are different, so the threshold of how far you can tune it will vary. If we relied on Intel to do this for us, the processors would probably be $70-100 more expensive because it's a time consuming process. Intel picks a voltage that works for all processors an leaves it at that. The side effect of them doing that is a little added heat, which they are willing to live with because 100% of their CPUs will work out of the box. If they tuned their CPUs to the lower limit, they risk messing up on one and it crashing, which is unacceptable from their point of view. In other words, they are taking the path of least resistance because 95% of customers probably don't care about having their CPU tuned properly. I also forgot to ask, do you think that is worth of getting the 1070 GPU if the laptop will not be used for heavy gaming 95% of the time when is used? And is the battery life be improved if you have the 1060 GPU over the 1070? If you don't play games 95% of the time, go with the 1060 for sure. Imho, it's not worth the price difference for the 1070 bump unless you need it daily. Hi again Derek! Im that Aussie that asked you a million q's about the GS 15" vs 17", remember me? Anyway tomorrow is crunch time for me and I have a huge decision to make and really need your input! All are small form factor and light, that's awesome. All screens are great. I want future proofing and good VR. However low power consumption ie optimus would be a bonus. Also a fully 170 degree plus lid would be nice. 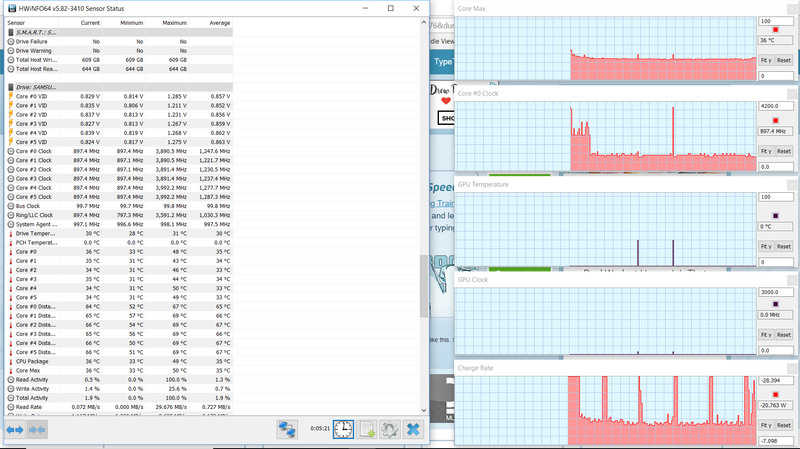 Both the GS and Aero are on par, with 6 core updated cpu which is great, but the Triton is the real Xfactor – I can get a 1080! I know the trackpad is garbage but i use a mouse, im sure the heat can be dealt with through UV, however no optimus will make a higher power bill and portability is killed with a crap battery. At the same price, I would do it. The only concessions with the Triton are the trackpad and battery. Everything else about the it is great though. After considering it carefully I agree with you and the whole 1080 thing, and the Triton is on its way! First up is I need to tackle the heat problem. The general consensus is that Grizzly Conductonaut will get the temps down dramatically, some realtime reports of even 70 degrees max under load! Amazing some ppl have clocked the card up to normal gtx1080 equivalent after repasting! Do you think UV will help with batt power? I understand the battery is just way to small (what were they thinking!? 41WR!!) I wonder if there's a way to improve the situation?? No problem and good luck with it. 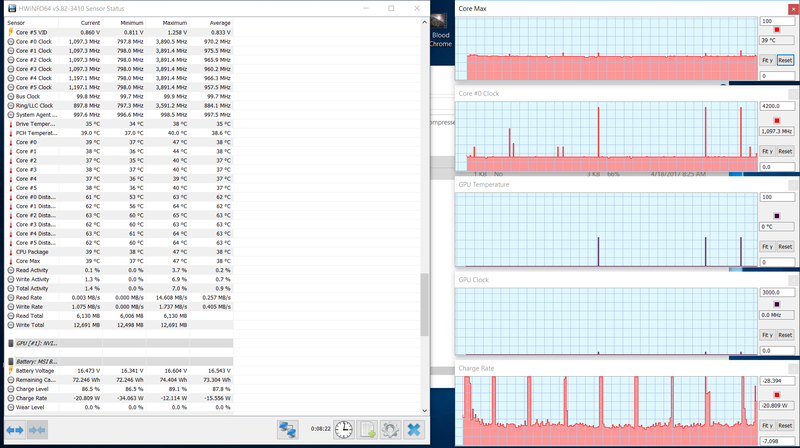 Undervolting will help a tiny bit. It would help more to make a custom throttlestop profile for when you're on battery. There's plenty of guides on how to set one up. In the end though, the battery life is still going to be low. Can you explain in detail what you did to tweak the fan settings? I just went into Dragon Center and switched it to advanced. I'm currently leaving the GPU at default, but with the CPU, I changed the settings to 30, 50, 60, 92, 127, 150 from left to right. Should the GPU settings be tweaked as well to prevent the temperature from hitting 80s and 90s? I would. You could probably use the same curve. It's just going to add a little more noise. Is this a pre-production unit or a retail because apparently the flex has been improved in the latest model ? A few questions. Do you use speedster and if so can you share your findings on settings? I just ordered this from hidevolution with aftermarket paste and will be undervolting…I was going to get the 1060 but the 1070 max q was only 100 bucks more so I went for it. Can you also share your throttlestop setting for battery if you don't mind? I haven't used speedster but I can look into it. Honestly, I quit using my battery throttlestop settings. I was only getting an extra 30 minutes of battery but it came at a cost of corippling my performance. 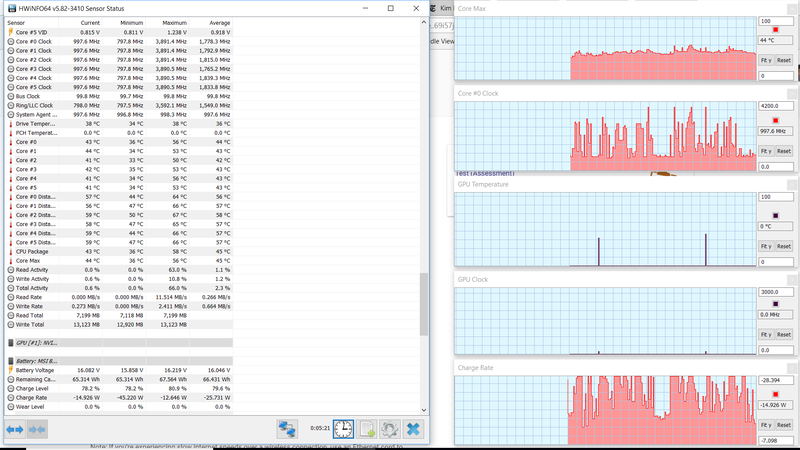 Ask you really need to do is reduce your CPU multiplier though. You can even try undervolting some more on that setting. Sorry, meant speedshift but think you got the drift. 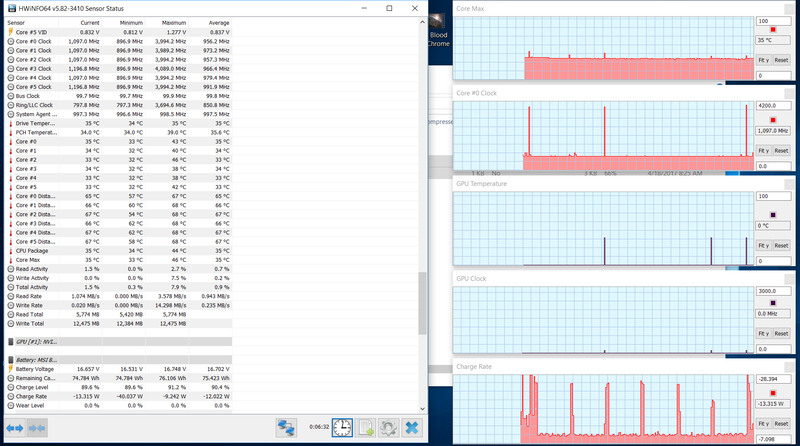 Was thinking about setting up profiles for gaming and for work but since I'm just undervolting, I guess windows normal power manager should take care of the non gaming times. I was wondering about speedshift as it seems a more customizable way to switch between work and play but may not matter. Thanks for this review! I thought it complemented another one that I read nicely. I especially liked the description of the case and the keyboard, including details about button placement. Anyway, I have a few questions. 1.) Sorry if this is dumb, but just to double check: does the version with GTX 1060 also have Optimus tech enabled? I'm definitely looking to get more battery life out of this and won't need the full performance. 2.) Where you did the battery test and mentioned the "Power Saver" profile, is that one of the modes from the Dragon Center? I'll reply to this before Derek gets to it. 1. Yes, there's Optimus on all versions. 2. Yes, or just one of the standard Windows power modes (click on the battery symbol in the right corner). I looked up a couple sources about the Shift mode thing — as it's the first time I've heard of it — and the available modes described in the below link don't have a "Power Saver". But it's also from 4 years ago, so I thought maybe they've since changed the software, profile names, etc. 3.) 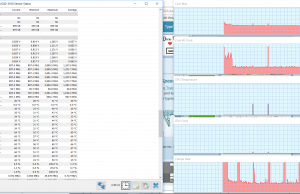 Is Shift mode profile switching better for tuning the battery life vs. performance trade-off than the Windows built-in Power Options, where you can simply reduce the max CPU state (%)? I stopped using dragon center and just use throttlestop. The dragon center power profiles we're overlapping the the throttlestop and windows profiles, which led to crippled CPU performance when on battery. 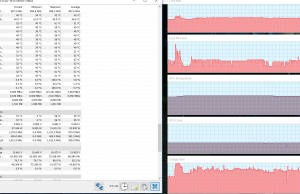 It's great for thermals and battery life but the performance drop was just too large for my taste, so I decided to manually tune it isln TS instead. Wow, I haven't heard of Throttlestop either until now… And I thought I could consider myself computer knowledgeable. Thanks! I'll be looking into it for sure. I'm pretty much all set on buying this baby. So is it a problem if I have Eco mode enabled in Dragon Center, and also use TS? When you say you stopped using it because the profiles were overlapping with the TS profile, it sounds like you had to disable the Dragon Center settings. Is that right? If so, how do you disable it?